His smiley face was irresistible, and since I had a Chapters gift card to spend, I decided to take him home with me. I just released him from his plastic trappings today. He has a long USB cord that extends from his head. As soon as I plugged him into my computer, his green indicator light (his heart?) lit up immediately. Awwh. Everything seemed to go smoothly as I extended his arms with two of my USB flash drives. Files were easily and quickly read. Then, I decided to plug my MP3 player into the his leg… And it read that too. At first. But after a minute, my MP3 player disappeared from “My Computer” and there was no way to access it. I reasoned that, even if it failed to work with my electronic devices, it would be still great if it could handle four flash drives. So, I took out my MP3 player and stuck two flash drives into the two remaining ports. They were read, and the windows asking me what action I wanted to take regarding each drive popped up, but seconds later, all four of my USB drives plugged into the little guy were unaccessible! It was as if I disconnected all the drives; they were not being read at all. Unplugging any two USB drives, though, allowed the remaining two drives to be immediately read. And so my fifteen-minute affair with a smiley USB guy ends in tragedy. It’s a shame that I’ll have to return him, not only because he’s adorable and that going back to Chapters is inconvenient, but because he would have rendered fumbling blindly around the back of my processor for hidden, dusty USB ports unnecessary. 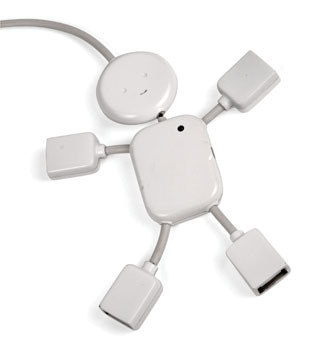 Well, it was nice knowing you, USB hub man. You and your cute green heart. It’s not by Apple, but the fact that “The William”, a new stovetop concept by designer Greg Beck, has an entire surface that can transfer heat (instead of just four burners) and is activated by the weight of pots placed on it, reminds me of Apple’s recent touchscreen technology. At first thought, I really liked this. It would be AWESOME having this in my kitchen. I could see the advantages of having a completely usable stovetop, and not being limited to cooking on four predefined spaces: You can cook a lot more different things, and if you were transferring heavy pots between burners, you wouldn’t have the drag the pots very far (really, you just move it to another empty space). But after a bit of thought, I realized that “The William” probably would work well with me, despite its goal of being accomodating to every cook. Often, the non-burner spaces on my stovetop (regarded as nonfunctional by the video) are where I rest my hot pots and pans. I can’t leave them on the burners, because I’m using them, but I never put them on my counters either, because that would damage them. So this brings me to the conclusion that a stovetop that automatically turns on whenever a pot is placed on top can be pretty annoying — what if I just wanted to put my pot of sauce down somewhere to cool down? I understand that you can click “Cancel” on the control panel to turn off the heat for that particular pot, but seeing that I randomly put various containers on my stovetop all the time, that process will prove to be just as annoying as Vista’s User Account Control. Perhaps it would work well with other cooks. Perhaps not. In any case, “The William” is a pretty interesting idea, and I wouldn’t mind at all seeing this developed into a fully functional prototype.